Baseball mitts can be made from a variety of materials, the most common (and time-tested) of which is leather. But there’s more than one type of leather. Lesser tier baseball gloves, like less expensive youth gloves, are made from synthetic leather. These generally do not take as much time to break in, and can stand up to the elements of water and sun a little better. Oiled leather gloves are a type of real leather and can be classified as “mid-tier” gloves. They are pre-oiled and conform to the player’s hand more than the synthetic gloves. The top tier, premium leather, comes at a higher price tag, but you get what you pay for – these leather baseball gloves will last a lifetime and truly feel unique to your hand. Baseball glove webbing is the “woven” section between the thumb and the forefinger, and it comes in two styles: open and closed. Closed webbing offers concealment of the ball (if you’re a pitcher), and also allows outfielders to block the sun better when standing under a fly ball. Open web baseball gloves come in handy when scooping up grounders, as it lets dirt and dust slide through with ease. Open web gloves are generally a bit lighter than closed web gloves, as well. Determining what size baseball glove to buy depends mainly on your position. Outfielders will generally want a larger glove with a deeper secure pocket – around 12.25 to 12.75 inches for adult players. Shortstops, on the other hand (ha) will generally have the smallest gloves on the field – around 11 to 11.5 inches. Second basemen require a similar, if not slightly larger glove, around 11.5 inches. And third basemen can step up even further – 11.5 to 12″ is average. The first baseman position, similar to outfield, is a position best-suited for players who are left-handers. First base gloves differ slightly in design, so be sure to select a baseball glove suited for your position. If you’re playing softball, glove sizes are inherently larger to accomodate a larger ball. 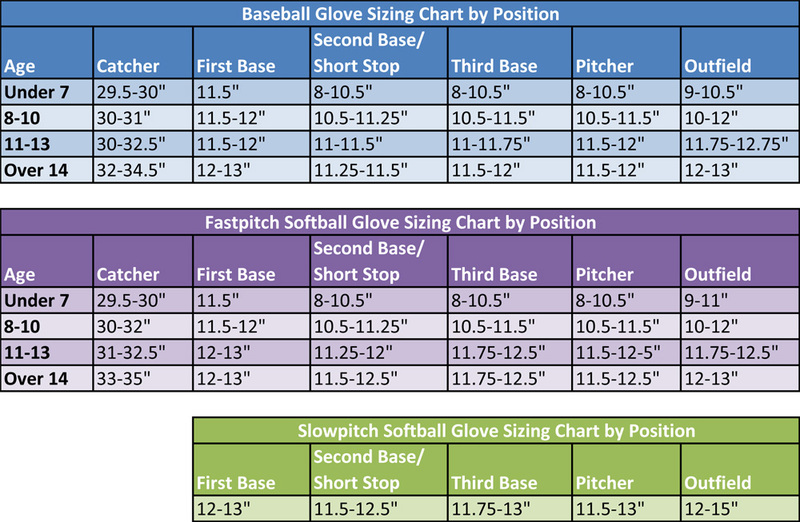 For a more complete sizing chart by age, check out Baseball Eagle’s comprehensive glove sizing chart. Tony Gwynn, Sandy Kofax, and many other baseball legends were left handed. Left-hand dominant baseball players are most suited for the positions of pitcher, outfield, and first base especially – as they can easily maneuver their body mechanics to throw to second for a double or triple play. If you or your child is a lefty, baseball gloves are manufactured in left hand throw models to accomodate these players.